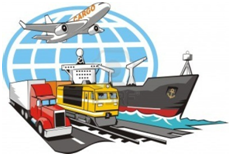 This part known as Logistics, which is one of the most important part in the supply chain. Logistics involves many parties. For example, a manufacturing company in Bandung – Indonesia, and a retailer in California – USA. How many paths should be traversed? Goods should be sent by road from Bandung to Jakarta, and then it will be sent to USA by sea or air, not to mention Customs arrangements in both origin and destination countries. Of course big capital is required, such as payment for transport, staffing, labors, Customs fees as well as information infrastructure. Back to Logistics, there are two main components, i.e. transport and warehouse / storage. From the below illustration we can see that the transport can be done by air, sea, land and rail. Important factors to consider are how to make an efficient delivery system at an affordable cost. The selection of transport mode and who will be the transporter are crucial. We will see more about transport in the Logistics part of this blog. Same as transport, we will see more about warehouse/storage in the Logistics part of this blog.